The perfectly manicured lawns surrounding City Hall contain a wealth of memorials to the history, people and events associated with the City. Among the most poignant are the Cenotaph built in memory of all those who died in the First World War and the Titanic Memorial Gardens which name all 1,512 victims of the disaster. Also worth seeing are the grand front gates of City Hall which bear the City Coat of Arms and are accompanied by two fine lamps which are adorned with seahorses and cherubs who each hold items representing the industrial and manufacturing heritage of the city. A memorial to the officers and men who died in the South African War (1899-1902). A bronze figure of a private of the regiment in khaki uniform, with topee and puttees, with a rifle and fixed bayonet at the ready stands upon a large boulder. Around the top of the plinth is a belt of bronze panels, with figures at each corner representing war, victory, death and fame. Unveiled in 1905, the sculptor was Sidney March. The last work of sculptor Sir Thomas Brock and originally unveiled in the North of Donegal Square in 1920, this memorial was moved in 1960 to where it stands now. In white Carrera marble, the female figure of Death or Fate looks down at two sea nymphs rising from the waves, with the body of a drowned sailor in their arms. It was thought at the time that only 22 local people had died in the disaster and only the names of those victims are recorded on the original memorial. Their names are listed on two sides in order of rank upon the ship. The Titanic Memorial Garden was officially opened on 15 April 2012 to commemorate the 100th anniversary of the sinking of RMS Titanic. The garden is set on two levels. The upper level contains a nine metre long plinth, inscribed with the names of those who died on RMS Titanic. The lower grassed terrace surrounds the existing Titanic monument. The upper level displays bronze plaques listing all 1,512 victims of the disaster in alphabetical order - passengers and crew. 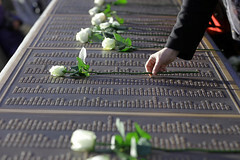 It’s the first memorial anywhere in the world to record all of the names of the victims on one monument. It is believed that a complete list of names was already in existence when the plaques were being designed, however this was not the case. Many existing lists documented the first class, second class and steerage, but did not necessarily include all the crew members, the Guarantee Group, the postal workers and the musicians. This is the first time the names of everyone who perished have been recorded on one monument. The Belfast List, as it is now known, is a key feature of the memorial garden. In the lower grassed terrace, the garden was built around the existing Titanic monument which was designed by Sir Thomas Brock. The garden is planted with springtime flowers whose colours were chosen to evoke images of water, ice and a sense of reflection. William Pirrie, Managing Director of the Harland and Wolff shipyard served as Lord Mayor of Belfast between 1896 and 1898. He was instrumental in the conception of Titanic but also in the idea of a new civic building for Belfast in City Hall. Designed by sculptor Bertram Pergram, this memorial was unveiled following his death in 1924 in Belfast's City Cemetery. After restoration, the bust was rededicated here in 2006 on the 159th anniversary of William Pirrie's birth. Plaques depict the Royal Victoria Hospital- a building which Pirrie was very involved in the construction of, and another depicts SS Venetian - the first ship to be built by Harland and Wolff. Memorial to Edward J Harland MP, founder of the Harland and Wolff shipyard and Mayor of Belfast from 1885 - 1886. The statue by Thomas Brock was unveiled in 1903. Harland was prominent in commerce and politics in Belfast and in 1889 he served as MP for north Belfast. The statue of Edward Harland shows him in morning dress, resting his left hand on a model of a ship’s hull sitting upon plans. This plaque was dedicated to the memory of Eliza Ward in 2002. At the age of 18, Eliza gave her life in protection of her employer near this spot in July 1997. Her selfless act of bravery resulted in the posthumous award of the George Cross by HM Queen Elizabeth II; a rare honour for a civilian to receive. A memorial to Sir James Haslett MP, Mayor of Belfast from 1887-1888. It was unveiled in 1909 and was sculpted by Frederick W Pomeroy. Haslett was educated at the Academical Institute Belfast and became a successful chemist and druggist. His portrait hangs in the Reception Room of City Hall. Unveiled in 1943 this column was originally situated at the gateway of City Hall but was moved to its current location and was rededicated in 1995 by American President Bill Clinton. It was designed by T F O Rippingham of Belfast and carved by Purdy and Millard. The monument marks the landing of the first American troops in Europe during the Second World War. It bears the badges of the United States Army, Marine Corps and Navy. Created by the sculptor Sir Thomas Brock to celebrate the Diamond Jubilee of Queen Victoria in 1897, it was unveiled by her son, King Edward VII in 1903. Carved from Sicilian marble and standing 11 feet high, this memorial is accompanied on each side by life size bronze figures representing spinning and shipbuilding. The reading child to the rear of the sculpture represents education. This memorial unveiled in 1999, commemorates the awarding of the Victoria Cross to Leading Seaman Magennis, for outstanding bravery in World War II. He served as a diver on H M Midget Submarine XE-3 and was crucial in her attack of the Japanese cruiser Takao on 31 July 1945. The Portland stone memorial was sculpted by Elizabeth McLaughlin and the bronze panels depict the details of his valour. Unveiled on 11 September 2002, the first anniversary of the tragic events, to commemorate all those who lost their lives in the terrorist attacks in New York, Washington DC and Pennsylvania on 11 September 2001. Sir Daniel Dixon was seven times Chief Magistrate, Chairman of the Harbour Board and Lord Mayor of Belfast in 1892-1893, 1901-1903 and 1905-1906. This memorial is the work of W Hamo Thorneycroft and was unveiled in 1910. Three bronze panels at the memorials base display ‘shipping’, ‘Belfast’ and ‘science, progress and education’. Lord Mayor of Belfast from 1910-1914, this Carrara marble statue is the work of F W Pomeroy and was unveiled in 1919. From 1910 – 1914 McMordie also served as MP for Belfast East. He was survived by his wife Julia McMordie, a well known philanthropist who in 1921 was one of two women elected to the first Parliament of Northern Ireland. This small sculptural bench was placed here in memory to the servicemen and women of Operation Banner (1969 - 2007). Operation Banner was the operational name for the British Armed Forces' operation in Northern Ireland from August 1969 to July 2007. It was the longest continuous deployment in the British military's history. The memorial was unveiled in 2013. This memorial was originally erected and dedicated in Chaegunghyon, Korea to commemorate men who fell during a tough defensive action in the mountains north of Seoul in January 1951. It was erected originally on the battlefield, but in 1952 was transported to Northern Ireland on the HMS Belfast and re-erected at St Patrick’s Barracks in Ballymena. The memorial was rededicated here at City Hall in 2010. Sculpted by Frederick Pomeroy and assisted by Sir Alfred Thomas Brumwell, the architect of City Hall, this memorial was unveiled in 1906. Frederick Temple the Marquess of Dufferin and Ava through a number of diplomatic roles worked in India, Canada, Russia, Turkey, Rome and Paris. The sculpture shows the Marquess depicted in the robes of the Order of St Patrick below a canopy surmounted by the winged figure of Fame. Accompanying figures represent Canada and India. The Belfast War Memorial is in the form of a cenotaph (a memorial to those who are buried elsewhere) with the backdrop of a colonnade. The memorial was unveiled on Armistice Day 11 November 1929. It was designed by Sir Alfred Brumwell Thomas and constructed by W J Campbell from 1925 to 1927. The colonnade consists of a Greek order of columns on a stylobate, with an enriched cornice and balustrade. Unveiled in 2009, this fountain is dedicated to all the council employees who were killed or injured at work from 1969 to 1999 during ‘the troubles’. The water of the fountain and trees planted in the courtyard represent hope, rebirth and a new beginning for Belfast.